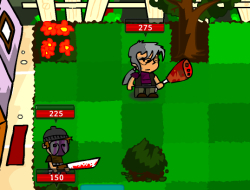 This is the second version of the great strategy game called Deadly Neighbors. Your goal remains the same in this one as well, meaning that you need to make sure that you come on top of each fight that you have with the neighboring families. Edit yours out and choose what classes you think are great together. Once you have done this you can move on and go ahead in the front yards and start your fights. You and the opponent family will take turns and use your abilities opportunities to walk where you want or attack. Try to out think the enemies and show them that your family is the best. Deadly Neighbors 2 0.00 between 0 and 10 based on 0 votes.